A Catholic church in Cheshire has become the first in the Diocese of Shrewsbury to welcome a family of Syrian refugees. Parishioners of the Church of Our Lady and St Christopher in Romiley, near Stockport, have welcomed a family of five from a refugee camp in Lebanon where they have lived since 2012 when they fled the country’s civil war. The couple in their 30s, whose children are all aged under 10 years, were resettled under the Government’s Community Sponsorship Scheme to relocate 20,000 refugees from the Syrian conflict. Parishioners were so generous in raising money to bring the family to Romiley that there was a surplus of funds so large that the parish is able to use it to relocate a second family later this year. Arrangements made by parishioners of St Winefride’s Church, Sandbach, to relocate a Syrian family are also well advanced and, according to Sean Ryan, Caritas national coordinator for the scheme, there is strong interest among parishioners of St Agnes’ Church in West Kirby, the Wirral, to bring a family of refugees there too. Canon Michael Gannon, the parish priest in Romiley, said that the Muslim family flew from Beirut to be welcomed by a party of parishioners who introduced them to their new home and provided them with a hot meal. Their arrival was the conclusion of an initiative which began in August 2017 with an appeal to raise the £9,000 to apply to the Home Office to take part in the scheme, for which Caritas Diocese of Shrewsbury acted as the lead sponsor. 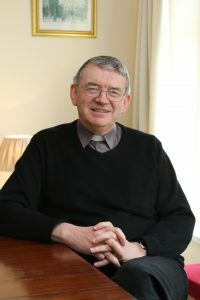 Mr Ryan visited the parish on two occasions to speak in the church and a “core group” of 17 people, with a range of professional skills, was set up to prepare for the arrival. Private rented accommodation within the parish was obtained and fitted and repaired through the generosity of parishioners who gave money, contributed items such as furniture, and who volunteered to carry out tasks such as painting and gardening. Now that the family is in Romiley, the group will help them to integrate them over a period of two years, assisting them, for instance, in learning English and in how to access and use public services. Canon Gannon, a Vicar General, said the project had not only benefited the family but also the life of the parish. “It has made a difference to people who previously knew each other perhaps on nodding terms,” he said. He continued: “I am personally, as parish priest, absolutely delighted … it is just wonderful to be able to do something practical to help a family who were forced to leave their country in very sad circumstances. “This is very much love in action, the Gospel in action. It is something Pope Francis fully endorses and I am just very pleased that our parish has been able to respond to that challenge and to the call of the Holy Father. A total of 30 per cent of funds raised by the Our Mission Together initiative were allocated for such parish projects. The first Catholic parish in the country to welcome a family of refugees from Syria was St Monica’s in Flixton, in the neighbouring Diocese of Salford where Mr Ryan is based. Mr Ryan said two other Salford parishes have since welcomed refugee families and eight more will do so by the end of summer, bringing the total of Salford parishes involved in the scheme to 11. He added: “It is a whole-society approach where grass roots ordinary people are working with government departments providing world-class support – they can’t do enough to help us.